If you’re having trouble viewing the bulletin, or to print your own copy, please click here. Last weekend, I shared numerous suggestions for each of us to engage in during this Advent Season in order to make the most of these short weeks (for example, blessing Advent wreaths and calendars as we did last Sunday, blessing straw for the manger and the Christmas tree that we are doing this morning, blessing bambinelli next Sunday, and so on). And here’s the reason why: earlier, during our opening prayer for today’s Mass, we prayed, “Almighty Father, may no earthly undertaking hinder us, who set out in haste to meet your Son.” We are seeking to move toward Christ with haste. But there are so many earthly undertakings that can hinder us, aren’t there? The winding turns of roadways that take us from this shopping center to another; the rough ways that have us scrambling to this party or that engagement; the deep valleys that provide all sorts of distractions in decorating, cleaning, cooking, mailing, and so much moreâ€¦all of these things done in the name of preparing for the Christmas feast, but these might just hinder us. Fly, instead, as the crow flies; make a bee line for the Christ! Cooperate with God’s promises from the prophets Baruch and Isaiah; from our current paths, from our present endeavors, we are invited to stop, lay them all asideâ€¦as we set out on a new path and move with great haste to meet the Christ. This is the purpose for leveling mountains: to ease our haste. This is the purpose for filling up valleys: to ease our haste. The purpose for crooked ways to be made straight: to ease our haste. The purpose for rough ways to be made smooth: to ease our haste. In the Advent Season we speed our return to God, we run to find Him as He reveals Himself in a child, we hasten to see the true Lord & Saviorâ€¦He and only He who even rules over powerful Caesar, Pilate, Herod, Caiaphas and Annas. This is the reason He is born: to save us who need saving! But we’ll only be able to hasten toward Him and the salvation He brings, if we listen attentively to the voice in the desert, and if we desire to set things aright. If wein the midst of crooked ways, temptations, and trialscan hear John’s invitation to seek Christwho is the source of all love, purity, justice and righteousnessthen we know He will also be with us until the day of Christ Jesus. That was our prayer this morning: that we hasten toward the One who has come, who comes again and again, and who brings salvation for the end of our days. May your paths this week be straight; may no valley consume you; may every hill rejuvenate you; and may the voice of the Holy Spirit remind you always that you are destined to live life with God for all eternity, through Christ our Lord. 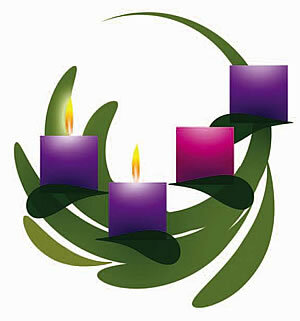 A blessed second week of Advent to each of you. As we enter the Advent season today, we could settle for the same as last year and accept that our lives will be pretty much unchanged by this season and every season of this new year. But we’re a people of HOPEas we recalled in our introductory rites of this Masshope that will not disappoint. But I would suggest that our hope be enflamed and our faithful waiting be active. I suggest that each of us and our families enliven our waiting in Advent this year: rediscovering the blessings of our faith and the Churchâ€¦there’s much in store for us who prepare well in Advent! My mom and dad would stock our family’s Advent calendar with goodies: maybe small tokens or pieces of candy or some coinsâ€¦little things that piqued our curiosities each morning when we would open the window or slide the hatch and discover the day’s trinkets. On the first Sunday of Advent, my dad and mom would bless our fresh wreath and candles before supper, and while lighting that candle on successive nights we would sing “O come, O come Emmanuel“â€¦okay it wasn’t pretty but it had an impact on us kids: our waiting was active, looking for One who was to come. On December 6th the feast of St. Nicholas we’d polish our shoes the night before (that was the one polish they got all, year!) and leave them outside our rooms before bed. Waking in the morning, we’d find them filled with chocolate coins and candies. As did any kid, we always looked forward to St. Nick’s feast. On the second Saturday of Advent, we would shop for a Christmas tree and decorate it, setting up our manger scenes throughout the house. On Sunday, after Mass, we would say a prayer of hope and blessing upon the tree and mangers. On December 12th the feast of St. Lucy we didn’t use electricity that evening, just tons of lit candles scattered throughout the house. Since television wasn’t an option, we would hold a game night in the dining room. We all got to choose a game we wanted the family to play and we would stay up late, enjoying the festivity of our little clan. On the third Sunday, we each would get our little baby Jesus figurines for our mangers and bring them to church for Fr. Starks to bless; of course, as soon as we got home we would hide them again until Christmas morning. 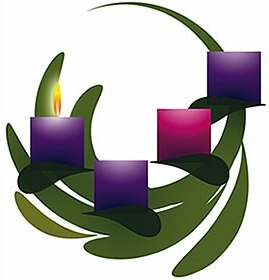 And beginning on December 17th, as we sat down for dinner and lit the advent wreath, we would sing the day’s “O antiphon“. We could feel we were getting so close to Christmas! These are the traditions of my childhood in Advent. They were activities that each and every day helped me to grow in my hope and appreciation for the Savior who is to come at Christmas. Every year it felt new, and alive, and excited. May this year’s Advent season be filled with that kind of excitement for each of us; may it be a time for us to grow in faith-filled hopean active and excited hopethat the One who is coming will come to bring us the newness of His own divine life.